All School Facilities Directors are asked to join Association leaders in communicating our school facilities' legislative and regulatory priorities. 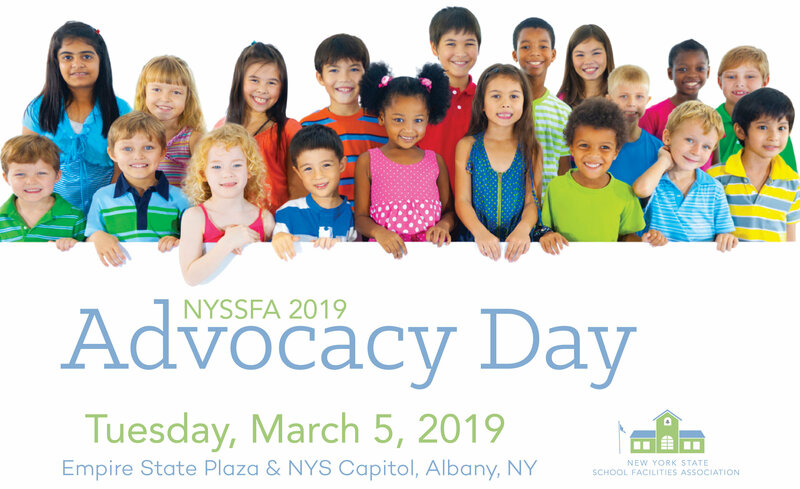 Please take this opportunity to support school facilities in NYS. Legislators need to hear a unified message from our members! Get Closer to the Top by Attending Classrooms of the Future Summit! Join us Wednesday, March 6 as experts review the requirements and timetable of the Building Condition Survey (BCS) coming in 2021. Following that, our training program will focus on one aspect of the BCS: Mold remediation. As always, our Summit will feature a timely update from the State Education Department's Office of Facilities Planning. More details to follow! The New York State Education Department and the CiTi BOCES are hosting an informational webinar on the Architectural and Engineering Project Review Training to be provided to third-party vendors, performing project reviews. This webinar will occur at the same time as the mandatory training session being provided to third-party vendors performing project reviews. The webinar will be open to Architects, Engineers, and the public. Access to the webinar will be limited to 500 attendees. In addition, it is anticipated the webinar will be recorded. The webinar will be held on Tuesday, February 5, 2019 at 8:30 a.m. It is anticipated the Architectural portion of the training will be presented between 8:30 a.m. and 12:00 noon; and the Engineering portion of the training will be presented between 12:45 and 4:30 p.m. Contact martin.doyle@nysed.gov with questions or concerns. The Benjamin Center for Public Policy Initiatives at SUNY New Paltz and New York State Assembly member Kevin Cahill D-Ulster, Dutchess, announced the launch of the $1 million Science Lab Initiative, which will bring new science and technology labs to area school districts. The Kingston City School District, New Paltz Central School District, Onteora Central School District, Red Hook Central School District, Rhinebeck Central School District, Rondout Valley Central School District, Wallkill Central School District, Ulster BOCES and Woodstock Day School will each receive $50,000 to support the purchase of equipment for their science and technology labs to be used by their respective students. The initiative seeks to encourage scientific curiosity and creativity, build interest in science and promote science education in the Hudson Valley, a news release said. Voters in the Hermon-DeKalb Central School District voted 106-8 Thursday in favor of a $15 million capital improvement project that includes remodeling the gymnasium. The project offers other upgrades including security improvements, roof replacement and installation of an elevator in the high school. School Superintendent Mark White said he believes the turnout was low due to the weather, but said the community has been very supportive of the project. State funds and the district’s capital reserve account will cover an estimated 98.7 percent of the cost. Mr. White said the project isn’t expected to begin until the 2024-25 school year and the district is still seeking other grants to pay for the remaining 1.3 percent of the cost. A nearly $50 million bond is being proposed by the Mamaroneck Board of Education to make health and safety upgrades to the schools and improve accessibility to those with disabilities. While this plan proposes a modest increase in taxes, it comes after back-to-back years of successful tax cap overrides. An overwhelming majority of residents both years voted in favor of piercing the state-imposed cap by raising the tax levy 4 percent in 2018 and 3 percent the year before that. "The community and the district has done a good job over 50 years to periodically invest in capital work and cycle these things through so not to do everything at once," said Superintendent Robert Shaps. "What we said to the public is we recognize we need to periodically invest in our schools to maintain safe schools and positive learning environments." The state Senate has passed legislation to make the property-tax cap permanent in New York. The move will put pressure on the Democratic-led Assembly to do the same as Gov. Andrew Cuomo has made making the cap permanent a key piece of his 100-day agenda of 2019. The measure passed the Senate, 58-2. The cap was put into place in 2011 at the urging of Cuomo to limit the growth in property taxes, which in New York are among the highest in the nation. The New York City suburbs pay among the highest property taxes in the nation, while some upstate counties pay the highest compared to home values.